Widely known for its beautifully entrancing range of colours, eudialyte is something out of a collector’s fantasy. Showing transition of a stunning array of colours, this gemstone looks like a majestic treat encrusted on your ring and earrings! Get a whole selection of adornments embellished with its timeless and classy beauty, only at TJC! Eudialyte is an extremely rare cyclosilicate mineral and was discovered somewhere in 1819, in Greenland. It flaunts a mesmerizing mix of different colours transitioning into one another, which makes it incredibly sought-after. Owing to its rarity, its demand is shooting for the sky. Most of the said gem is extracted and supplied from Kola Peninsula, in Russia. The site of the mineral’s presence dates back to almost 360 million years ago! The red silicate mineral is formed in alkaline igneous rocks. In fact, the said gem is considered to be a valuable source of zirconium in the coming future. The best presentations of this stone are spotted in semi to large crystals with deep red colour and an embedded matrix of black, grey, and white. The name of the stone is derived from the Greek phrase “eu dialytos,” which essentially means “easy to dissolve.” The name is given to the gem because of its weak structuring and because it tends to dissolve if exposed to harming acids. There are a lot of things that set this stone apart from all the others. Its arresting transitioning of deep and intense colours is one major part of its appeal. There a lot of gemstone connoisseurs across the world who call it “Dragon’s blood,” given its deep and rich red, swirling hue. Add to that the out-worldly streaks of grey and white, and we have one of the most gorgeous gems showcased in our collection. Rating 5 to 5.5 on the Mohs scale of hardness, eudialyte is a comparatively weaker stone than all the other crystals, making it much more prone to damage if hit with bunt force. Not just that, it tends to shatter and/or chip during the process of faceting, which is a reason why you’ll mostly find cabochons of the stone. In terms of any treatment, eudialyte is a one hundred percent naturally-occurring stone and is not exposed to any sort of treatment. You’ll wear the stone just as it was mined. So, come and shop for the stunning gem embellished in rings, pendants, earrings, and more! There are a lot of healing properties that have been regarded with the stone. Several people say that it is an excellent source of positive vibrations and powers, which makes it ideal to be healers’ stone. Other things that this stone helps you with are joy, happiness, and completeness. Several people maintain to claim that eudialyte has helped them let go of feelings of pessimism, longing, and negative thoughts that kept them from living a happy and fulfilling life. It is also said that the stone assists you into openly accepting all the good and prosperity that comes your way. Many healers say that it is just the stone you need to boost your creativity. It also helps you in finding out the things and areas of your creative life where you’re good at. It aids overall creative development and evolution. Healers say it is the ideal stone for all the people who wish to welcome some synchronicity and happy coincidences in their life. It helps you have helpful insights and makes things fall in place. The positive vibrations also help you balance your emotions and stay peaceful. In this section, we’ll let you know how to care for this gem. Seeing that it rates pretty low on the Mohs scale of harness, it needs to be taken extensive care of. It is prone to chipping and shattering if it meets any forceful trauma. So, you’re advised to not wear it if you’re going to be involved in any outdoor excursions, sport, or even indoor manual chores. Now, when it comes to the cleaning of the stone, the process is as easy as it gets. You can just rinse the stone under a stream of cool water. If you wish to be more thorough, you can always dip the stone in a soapy solution with warm water. If you’re finding some persistent dirt, you can use a soft-bristled toothbrush to clean the underside. Rinse in cool water and wipe with a soft towel. Mind that harsh fabrics and excessive force may cause scratches. Do not expose the stone to harsh chemicals, ultrasonic or steam cleaners! 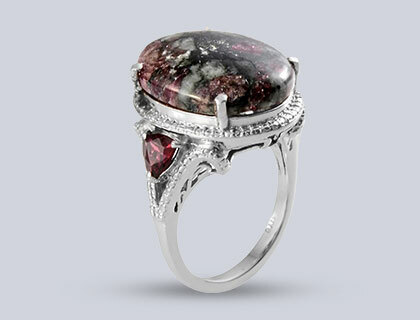 Eudialyte is one of the most coveted gemstones in our collection, owing to its entrancing play of colours. Steaked with white and grey, the stone portrays a brilliant deep, crimson colour. It is referred to as Dragon Blood by many collectors. It only rates 5 to 5.5 on the Mohs scale of hardness, which makes it a relatively weaker crystal. So, it needs a lot of care. TJC gets its stone from Russian mine, but there are several other places where it can be sources from, like Madagascar, Canada, Greenland, and The United States of America. It is considered to be a promising source of zirconium in the future.